Received 26 Feb. 1999; and in revised form 12 May 1999; accepted 23 Aug. 1999. 1 Forensic Scientist, Minnesota Forensic Science Laboratory, 1246 University Ave, St. Paul, Minnesota. This project was supported by the Federal Bureau of Investigation (FBI), Minneapolis Field Office. The following questions regarding the detection of psychoactive drugs in mushrooms are addressed: At what stage of the mushroom development can the psychoactive drugs psilocyn and psilocybin be identified, and what effect does light have on the growth of these mushrooms. To answer these questions, Psilocybe cyanescens Wakefield mushrooms were grown from their spores in a controlled setting. At various times of their development, samples were taken and analyzed for psilocyn and psilocybin. Knowing what stage of development the psychoactive drugs can be identified may be useful to law enforcement personnel and forensic chemists. 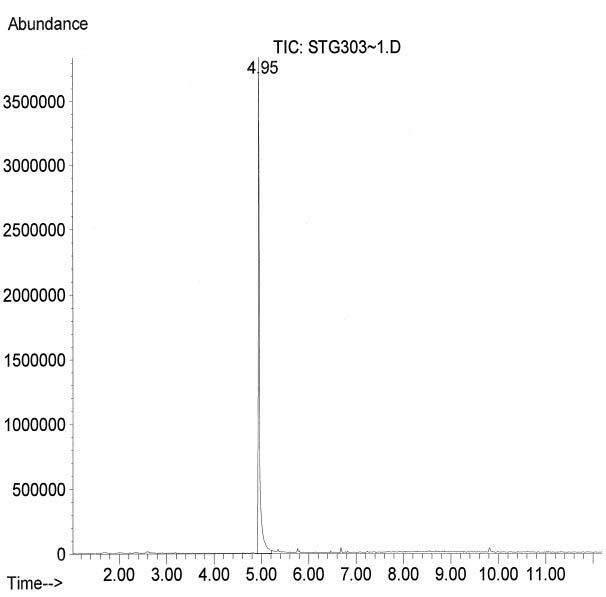 Methanolic extracts of various samples were analyzed by TLC and by GC/MS. 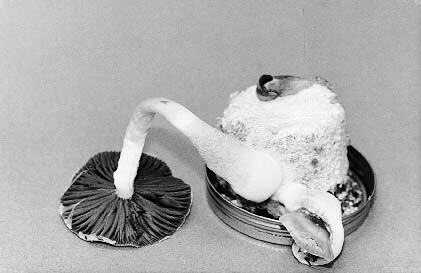 It was determined that the mycelium knot stage of the mushroom was the earliest stage at which the psychoactive drugs could be detected. It was observed that light affected the time of development and the appearance of these mushrooms. Law enforcement agencies in Minnesota are beginning to see an increased number of mushroom growing operations. Knowing what stage of development the psychoactive drugs can be identified may be useful to law enforcement personnel and forensic chemists. This information is important because in the state of Minnesota it is illegal to possess any material, compound, mixture or preparation which contain any quantity of psilocyn and/or psilocybin1. The word mushroom is a general term used to describe the relatively large and fleshy fruiting bodies of fungi, particularly all gill fungi. They are fungi that differ from plants in that these lack roots, stems, leaves, flowers, seeds and chlorophyll. Since mushrooms lack chlorophyll, they depend upon their surrounding medium for their nutrients. The vegetative portion of the fungus accumulates a reserve of food from the immediate surroundings in order to develop fruiting bodies2-3. Fungi are categorized as follows: kingdom, phylum, class, order, family, genus, and species. Mushrooms containing psychotropic drugs are classified in the kingdom Mycota, the phylum Basidiomycota, the class Hymenomycetes, and the order Agaricales. There are four families of mushrooms, Strophariaceae, Bolbitiaceae, Coprinaceae, and Cortinariaceae, that contain psilocybin, psilocyn, or related alkaloids with an indolic nucleus. The genus and species of Psilocybe mushrooms that were grown were identified as Psilocybe cyanescens. The pleurocystidia sizes noted in the keys describing the Psilocybe cyanescens mushroom varied slightly from the mushrooms grown. This may indicate a variant of this species (communication with Dr. David McLaughlin, Plant Biology Department, University of Minnesota)2,4,5-8. The four stages making up the life cycle of a mushroom are the spores, the mycelium, the primordia, and the mature fruit. 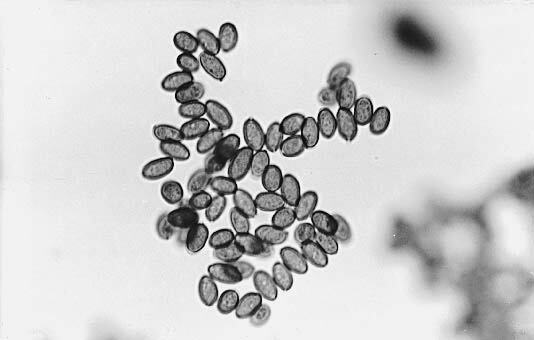 The spores are the reproductive cells or "seeds" of the fungi (Fig. 1). Germination of the spores takes place when a suitable substrate and correct environmental conditions are present. These spores grow outward seeking nutrients and branch out forming a complex "coblike" system. This "cob-like" system is the vegetative portion of the fungus which is called the mycelium (Fig. 2). 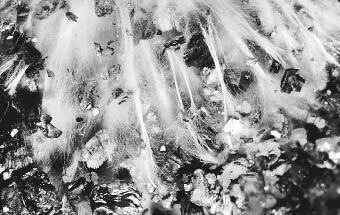 The mycelium absorbs water and nutrients from the substrate which is used in the production of the fruiting bodies. The ability of a fungus to begin fruiting is affected by genetic competence and various environmental factors including moisture, temperature, light, and aeration. The formation and growth of the fruiting bodies is known as primordia and has been referred to as "mycelium knots" and "pinheads." The "mycelium knot" is referring to the initial fruiting body that is formed when the mycelium clumps together and seems to form a "knot" (Fig. 3). This knot eventually grows into the "pinhead," a plump growth, yellow in color and with a brown tip (Fig. 4). The fruit is considered mature when it is able to disperse spores and begin this life cycle over again (Figs. 5-6)2,9. Fig. 1 - The aqueous spore solution viewed using a 1250 x magnification microscope. The spores are the first stage of the mushroom's life cycle. One milliliter of spore solution was used to inoculate each 1/2 pint jar. Fig. 2 - The vegetative portion of the fungus is called the mycelium. This is the second stage of the mushroom's life cycle. The first sign of mycelium growth appears 4 to 6 days after inoculation. Fig. 3 - The third stage of the mushroom's life cycle is the primordia, and has been referred to as "mycelium knots" and "pinheads." The mycelium knots are the initial fruiting body that is formed when themycelium clumps together and seems to form a "knot". Fig. 4 - The third stage of the mushroom's life cycle is the primordia, and has been referred to as "mycelium knots" and "pinheads." The pinheads are plump growths, yellow in color with a brown tip. Fig. 5 - The fourth stage of the mushroom's life cycle is the mature fruit. Mushrooms are considered mature once they are able to disperse spores and begin the life cycle over again. Mature Psilocybe cyanescens Wakefield mushrooms. Fig. 6 - The fourth stage of the mushroom's life cycle is the mature fruit. Mushrooms are considered mature once they are able to disper se spores and begin the life cycle over again. Mature Psilocybe cyanescens Wakefield mushrooms. Directions for preparing the growing media were received with the spores. Supplies used for the growing media were half-pint wide-mouth jars (Kerr Group, Inc. Jackson, TN), horticultural vermiculite (Schultz, St. Louis MO), brown rice powder and distilled water. The canning lids were prepared before the mixture was added to the jars. The rubber sealing edge of the canning lids were turned upwards and four holes were punched symmetrically around the outer edge. A mixture of 1/4 cup brown rice powder, 1/2 cup vermiculite and 1/4 cup distilled water was prepared for each 1/2 pint jar. This mixture was placed into the jars and covered with dry vermiculite. The lids were screwed on tightly and aluminum foil was used to cover the lids to prevent additional water from entering the jars during sterilization. Since growing media is susceptible to contamination, the top layer of dry vermiculite was used to keep airborne contaminants from the wet substrate and absorb and regulate moisture transpiration and condensation10. The jars with the growing media mixture were sterilized at 120°C for 20 minutes. The jars were cooled before inoculation. Contamination was detectable through various colors from pastels to black. The growing media that became contaminated was observed but was not analyzed. Eight jars per week were inoculated with 1 mL of spore solution. This was done for 9 weeks for a total of 72 inoculations. In addition to the eight jars inoculated per week, one jar per week was not inoculated and was used as a control blank. During the first four weeks, all samples were allowed to grow under indirect light. The last five weeks, half of the samples were allowed to grow under indirect light while the other half were kept in the dark. The jars kept in the dark were exposed to light only when samples were taken. Each jar was covered with parafilm after inoculation to keep airborne contaminates from the substrate. The samples were transferred to terrariums after the pinheads became too large for the jars they were growing in. Two different terrariums were used for this experiment. The first one consisted of a styrofoam cooler with a piece of plexiglas inside of it. The second terrarium consisted of a 2-liter pop bottle with the middle portion cut out. To maintain a high level of humidity, both terrariums were sprayed with distilled water two to four times a day. Fanning the chamber with the lids two to four times a day also kept the terrariums well ventilated. Samples were allowed to soak in methanol overnight. The methanol was decanted into a shell vial which was then condensed to near dryness (<1/2 mL) using a stream of air. An aliquot was removed for thin-layer chromatography (TLC). The mycelium knot samples were analyzed by TLC and by gas chromatography with a mass spectrometer (GC/MS) in this methanolic extract state without any clean-up. 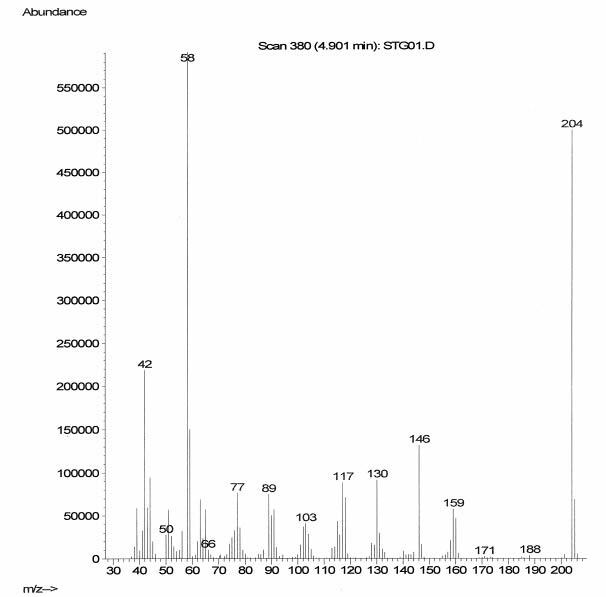 The extracts were cleaned up with an acid solution for GC/MS analysis. A 0.2 N solution of sulfuric acid was used to resuspend and acidify the extract. This solution was washed twice with chloroform to remove the neutral organic compounds. The samples were made basic with sodium bicarbonate and the psychoactive drugs were extracted twice with chloroform. The chloroform was evaporated and the sample was reconstituted with methanol for GC/MS analysis. TLC was carried out on 5 x 10 cm silica gel plates (Analtech Newar, DE). Psilocyn (Alltech State College, PA) and psilocybin (Alltech State College, PA) standards were spotted on each plate along with the sample extracts. The plates were developed to 6 cm at room temperature in a covered development tank with a 9:1 chloroform/methanol solution. A beaker containing 3 mL of ammonium hydroxide was placed in the tank to assist in development. The plate was dried with low heat and visualized with a paradimethylaminobenzaldehyde (p-DMAB) spray reagent. (The p-DMAB reagent consisted of 2 g of p-DMAB in 50 mL of ethanol and 50 mL of hydrochloric acid.) The relative Rf value of psilocybin is 0.00 and the relative Rf value of psilocyn is 0.85. The Hewlett Packard gas chromatograph 5890 Series II interfaced with the Hewlett Packard 5970 series mass selective detector (MSD) and the Hewlett Packard G1800A gas chromatograph detector system (GCD) were used for the detection of the analytes. These two instruments are equivalent and samples were run on specific instruments depending upon their availability. An HP-1 12 m column (film thickness 0.33 µm, column id 0.2 mm) was used for the gas chromatography (GC). The parameters for the GCD were as follows: injection port 250°C and detector temperature 280°C. Method SCAN70 - Low mass 35, high mass 425, initial temperature 70°C, ramp rate 25°C/min and final temperature 300°C hold for 3.0 minutes. The parameters for the MSD were as follows: injection port 265°C and detector temperature 280°C. Method SCN90 - Low mass 35, high mass 400, initial temperature 90°C, ramp rate 25°C/min, and final temperature 300°C hold for 4.0 minutes. 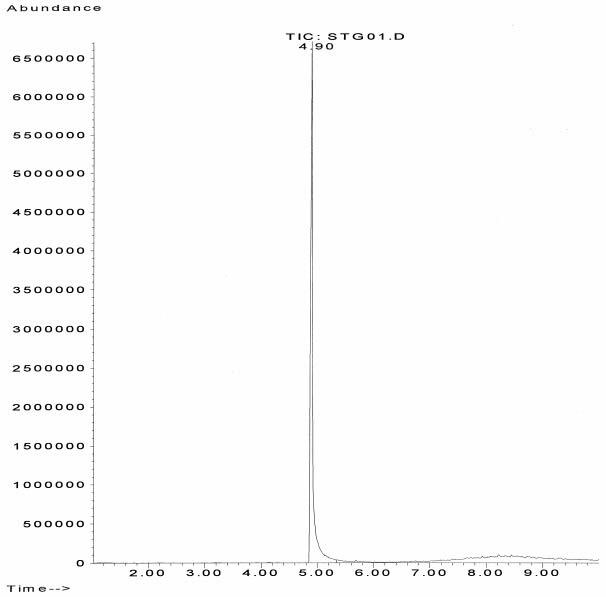 Sample volume was approximately 3 µL with the split ratio of 30:1. Identification of the mushrooms grown in this project was made by examination of the spores, fruiting bodies and the mature mushroom. Spores were examined for their color, shape, and size. The spores were purple to brown in color and elliptical to oblong elliptical in shape. They ranged is size from 6.7-8.2 µm by 12.6-15.0 µm. The fruiting bodies were examined mainly for color. 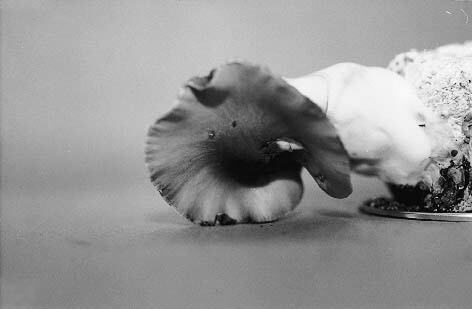 The mature mushroom was examined for shape, size, color, texture, gill characteristics, and general appearance. Mycelium growth was observed from 4 to 6 days. Fruiting bodies were observed from 24 to 48 days. The average amount of time for the primordia to appear was 32 days. Samples of mycelium were taken after 13 days of growth, 20 days of growth, and at various other days of growth. A total of 29 samples of the white mycelium growth were analyzed. No psilocyn or psilocybin was detected in any of these 29 samples. Nine of the 29 samples were confirmed by GC/MS, and again no psilocyn was detected. Samples were analyzed after the first sign of growth of mycelium knots. A total of 22 mycelium knot samples were analyzed by TLC. Samples were considered to be consistent with a standard if their relative Rf value and their color matched the standard also spotted on the plate. Samples were considered to indicate a standard if their relative Rf value matched the standard but the color was not as dark as the standard spotted. Of the 22 mycelium knot samples, 17 were consistent with psilocyn. Of these 17 samples, 8 were also consistent with psilocybin and 1 indicated there was psilocybin in the sample. Four samples were consistent with the psilocybin standard spotted on the TLC plate, and one of these samples also indicated there was psilocyn in the sample. There was no psychoactive drugs detected in one of the samples. 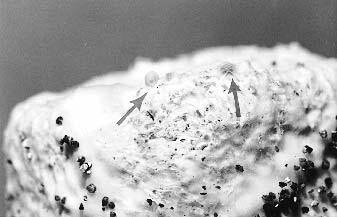 Samples were analyzed after the first pinheads of the fruiting bodies were observed. A total of 25 samples of the pinheads were analyzed by TLC. All 25 samples were with the psilocyn standard spotted on the TLC plate. Of these 25 samples, 3 were also consistent with the psilocybin standard spotted and 3 indicated there was psilocybin in the sample (Table 1). The 22 mycelium knot samples were also analyzed by GC/MS. In the inlet system of the gas chromatograph, thermal dephosphorylation of psilocybin occurs. As a result of this degradation of psilocybin to psilocyn, one is unable to differentiate the two by GC/MS. With this inability to differentiate psilocyn and psilocybin, it is unknown if the starting material contains psilocyn, psilocybin, or a mixture of both drugs. For this project, only a psilocyn standard was analyzed by GC/MS (Figs. 7-9). Samples were considered to be consistent with psilocyn if their retention time and mass spectral fragmentation pattern matched that of the psilocyn standard. Samples were considered to indicate psilocyn if their retention time was consistent with the psilocyn standard and contained the prominent ions, but were lacking ions in the total fragmentation pattern. Of these 22 mycelium knot samples, 12 were consistent with the psilocyn standard. Seven samples were found to indicate psilocyn, and there were three samples where psilocyn was not detected. * Results of thin layer chromatography (TLC) on the various stages of development of the Psilocybe cyanescens mushroom. TLC was carried out on 5 x 10 cm silica gel plates and developed with a 9:1 chloroform/methanol solution. Plates were visualized with p-DMAB spray reagent. Samples were considered to be consistent with (c/w) a standard if their relative Rf value and their color matched the standard also spotted on the plate. Samples were considered to indicate a standard if their Rf value matched the standard but the color was not as dark as the standard spotted. Fig. 7 - Total Ion Chromatogram (TIC) of psilocyn standard analyzed on a Hewlett Packard 5970 series mass selective detector (MSD) with the following parameters: injection port 265°C and detector temperature 280°C. Initial temperature 90°C, ramp rate 25°C/min and final temperature 300°C with a hold of 4 min. Fig. 8 - Mass spectrum of psilocyn standard analyzed on a Hewlett Packard 5970 series mass selective detector (MSD) with the following parameters: injection port 265°C and detector temperature 280°C. Initial temperature 90°C, ramp rate 25°C/min and final temperature 300°C with a hold of 4 min. Fig. 9 - Expanded mass spectrum of psilocyn standard analyzed on a Hewlett Packard 5970 series mass selective detector (MSD) with the following parameters: injection port 265°C and detector temperature 280°C. Initial temperature 90°C, ramp rate 25°C/min and final temperature 300°C with a hold of 4 min. * Results of gas chromatography/mass spectrometer (GC/MS) on the various stages of development of the Psilocybe cyanescens mushrooms. Samples were analyzed on Hewlett Packard gas chromatograph 5890 Series II interfaced with Hewlett Packard 5970 series mass selective detector (MSD) and the Hewlett Packard G1800A gas chromatograph detector system (GCD). Samples were considered to be consistent with (c/w) psilocyn if their retention time and mass spectral fragmentation pattern matched that of the psilocyn standard. Samples were considered to indicate psilocyn if their retention time was consistent with the psilocyn standard and contained the prominent ions, but were lacking ions in the total fragmentation pattern. Fig. 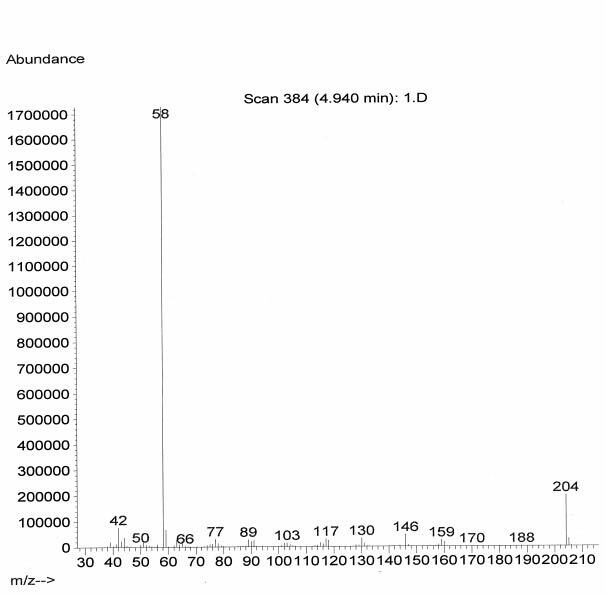 10 - Total Ion Chromatogram (TIC) of a mushroom sample analyzed on a Hewlett Packard 5970 series mass selective detector (MSD) with the following parameters: injection port 265°C and detector temperature 280°C. Initial temperature 90°C, ramp rate 25°C/min and final temperature 300°C with a hold of 4 min. Fig. 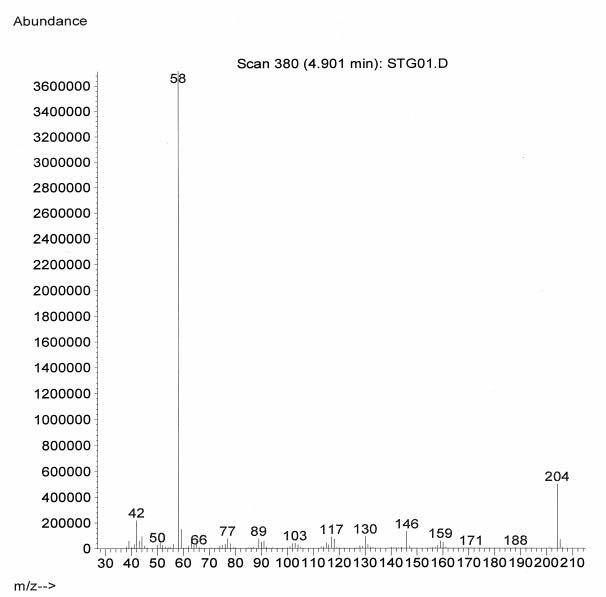 11 - Mass spectrum of a mushroom sample analyzed on a Hewlett Packard 5970 series mass selective detector (MSD) with the following parameters: injection port 265°C and detector temperature 280°C. Initial temperature 90°C, ramp rate 25°C/min and final temperature 300°C with a hold of 4 min. Fig. 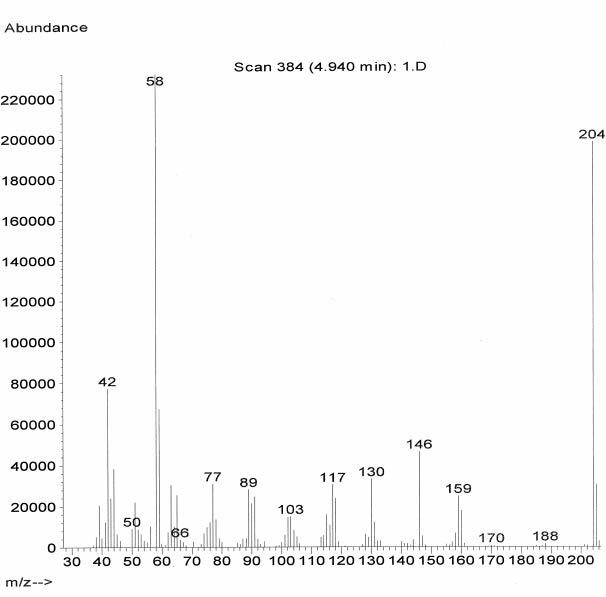 12 - Expanded mass spectrum of a mushroom sample analyzed on a Hewlett Packard 5970 series mass selective detector (MSD) with the following parameters: injection port 265°C and detector temperature 280°C. Initial temperature 90°C, ramp rate 25°C/min and final temperature 300°C with a hold of 4 min. There were some noticeable differences in the samples grown under indirect light versus the samples grown in the dark. All samples started to show mycelium growth at 4 days. The first signs of fruiting bodies were observed to be from 19 to 25 days in the samples that were grown under indirect light with the average being 21 days. 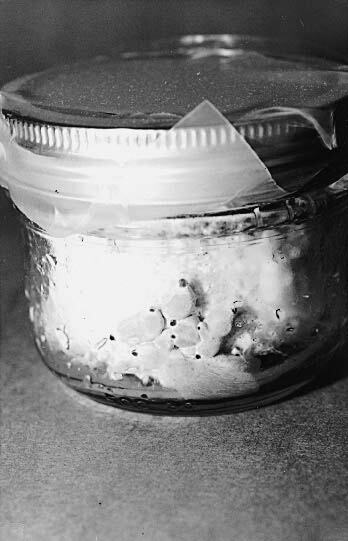 The first signs of fruiting bodies were observed from 23 to 45 days for the samples that were grown in the dark, with the average being 26 days. The samples that were grown under indirect light had primordia which grew faster and larger. They were plump, yellow in color with brown tips. The samples that were grown in the dark had small white primordia that were skinny and long. The coloring was off-white with only a few having dark brown tips. The mushrooms that were grown under indirect light had thick stipes with yellowish to chestnut colored caps. The mushrooms that were grown in the dark had lighter stipes that were much skinner than the mushrooms grown in the light. The caps of the mushrooms grown in the dark were also lighter in color than the mushrooms grown under indirect light. Psilocyn and/or psilocybin was detected in the mycelium knots, the pinheads and the mature mushrooms of all samples grown either in the dark or the light. Minnesota Statues Chapter 152.02. Schedules of controlled substances; Subdivision 2. Schedule I. The following items are listed in Schedule I: (3) Any material, compound, mixture or preparation which contains any quantity of the following hallucinogenic substances, their salts, isomers and salts of isomers, unless specifically excepted, whenever the existence of such salts, isomers, and salts of isomers is possible within the specific chemical designation: 3,4-methylenedioxyamphetamine; 4-bromo-2,5-dimethoxyamphetamine; 2,5-dimethoxyamphetamine; 4-methoxyamphetamine; 5-methoxy-3,4-methylenedioxyamphetamine; Bufotenine; Diethyltryptamine; Dimethyltryptamine; 3,4,5-trimethoxyamphetamine; 4-methyl-2,5-dimethoxyamphetamine; Ibogaine; Lysergic acid diethylamide; Marijuana; Mescaline; N-ethyl-3-piperidyl benzilate; N-methyl-3-piperidyl benzilate; Psilocybin; Psilocyn; Tetrahydrocannabinols; 1-(1-(2-thienyl) cyclyohexyl) piperidine; N-ethyl-1-phenyl-cyclohexylamine; 1-(1-phenylcyclohexyl) pyrrolidine. Kaul TN. Introduction to mushroom science. Enfield, New Hampshire: Science Publishers, Inc., 1997. McKnight KH and McKnight VB. A field guide to mushrooms. Boston: Houghton Mifflin Company, 1987. Rumack BH and Salzman E. Mushroom poisoning: diagnosis and treatment. West Palm Beach, Florida: CRC Press, Inc., 1978. Ammirati JF, Traquair JA, and Horgen PA. Poisonous mushrooms of the Northern United States and Canada. Minneapolis: University of Minnesota Press, 1985. Guzmán G. The genus Psilocybe. Nova Hedwigia: Beih, 1983;74:1-439. Guzmán G. Supplement to the monograph of the genus Psilocybe. In: Petrini O and Horak E, eds., Taxonomic monographs of Agaricales. Bibliotheca Mycologica 1995;159:91-141. Singer R and Smith AH. Mycological investigations on teonanácatl, the Mexican hallucinogenic mushroom: Part II. A taxonomic monograph of Psilocybe, section Caerulescentes. Mycologia 1958;50:262-303. Stamets P and Chilton JS. The mushroom cultivator. Olympia, Washington: Agarikon Press, 1983.